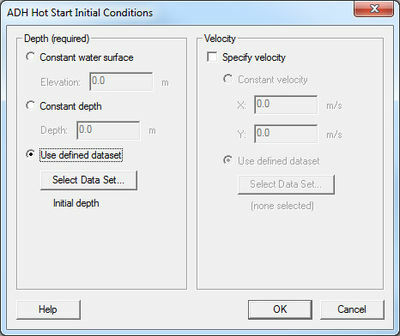 This window can be accessed by the ADH | Hot Start Initial Conditions menu item. ADH requires that at least an initial depth dataset is defined to start a simulation. ADH can not start with a completely dry domain. The initial condition datasets will be generated and appear in the "ADH Hot Start" folder of the Project Explorer. This folder and the datasets are locked for editing except from this dialog. Constant water surface / Constant depth / Use defined dataset radio group specifies the method for defining the initial depth dataset. The Constant water surface control group includes the Elevation real number edit field which only allows elevations greater than the maximum mesh elevation. This produces a fully flooded domain with a flat horizontal water surface. The Constant depth control group similarly includes the Depth positive real number edit field. The depth value is applied to every node to create a water surface which is offset from the mesh geometry. The Use defined dataset control group allows for the selection of an existing scalar dataset located in the Project Explorer via Select Dataset... button. The name and time step information (if transient) of the selected dataset will appear below this button. Specify velocity check box specifies whether an initial velocity dataset will be included and if checked, enables the Constant velocity / Use defined dataset method specification radio group. The Constant velocity control group includes X and Y velocity component real number edit fields. The composite velocity vector will be applied to every node in the domain. The Use defined dataset control group allows for the selection of an existing vector dataset located in the Project Explorer via Select Dataset... button. The name and time step information (if transient) of the selected dataset will appear below this button. This page was last edited on 16 February 2016, at 16:06.